Participatory design workshop for our boulder in Montbello Park on January 28, 2018. The workshop took place at the American Mountaineering Center (710 10th St, Golden, CO 80401) with The North Face, ELK, Brown Girls who Climb, Brothers of Climbing, ID Sculpture and others. It’s not easy to get into rock climbing. Starting out means building strength, mastering knots and gear, and—for some of us, anyway!—conquering a fear of heights. But for many would-be climbers, the hardest part isn’t technical know-how or tricky moves: it’s just getting to the wall. Once considered the realm of diehard mountaineers, climbing today is going mainstream: more than six million Americans will try the sport this year. 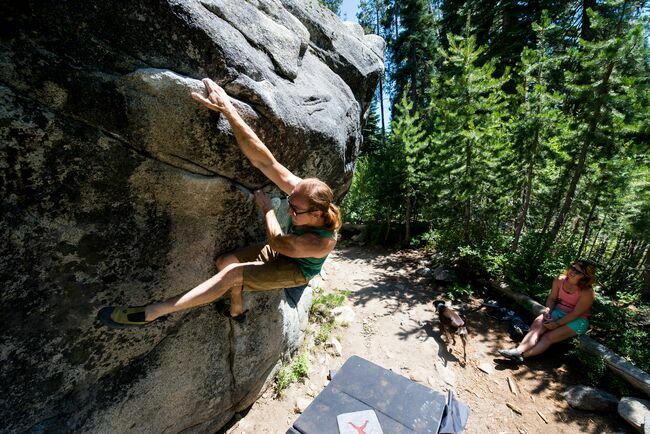 But most outdoor climbing areas lie beyond city limits, and indoor gym fees put the sport—and the benefits of improved strength, balance, and flexibility—out of reach for many who’d like to try it. That’s why park districts across the country are working to bring public climbing facilities to city parks and recreation centers. Bozeman, Montana, boasts five free climbing walls—and The Trust for Public Land plans to add one more at Story Mill Community Park. The Portland, Oregon, parks department owns a climbing wall on wheels that makes appearance at parks and special events around the city. And the interest in free climbing walls isn’t limited to mountain towns with outdoorsy reputations: the biggest public climbing wall in the country stands in Scioto Audubon Park in Westerville, Ohio. 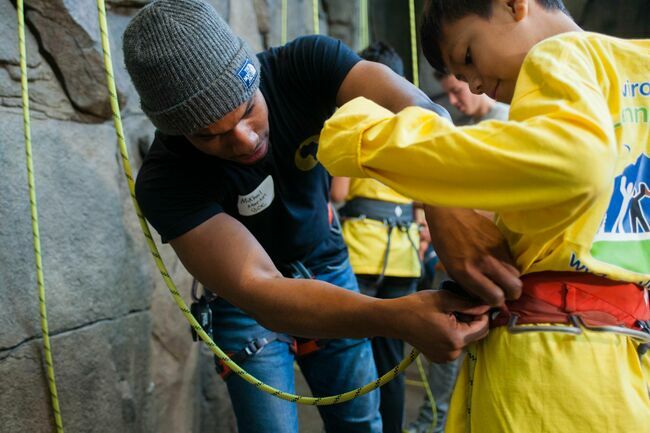 Thanks to a partnership with The North Face as part of the company's "Walls Are Meant For Climbing" campaign, The Trust for Public Land is working to create more free climbing walls in city parks around the country—starting in neighborhoods where kids face the highest barriers to exploring the outdoors. Our first climbing wall completed in partnership with The North Face opens this week in Denver’s Montbello Open Space Park. The 11-foot-tall boulder offers a way to climb without having to find a ride to the mountains or shell out for specialized gear or a gym pass. The new climbing wall is just one reason we’re excited about the new Montbello Open Space Park. Located in a dense, diverse Denver neighborhood where a quarter of residents live below the poverty line, it’s a once-vacant lot being restored to native prairie with trails, artwork, and interpretive displays. The park will also be the new headquarters of a local outdoor education center, Environmental Learning for Kids—whose students helped design the park themselves. We all need to be introduced to new things AND nature! I support this new opportunity close to home for those climbers who want to try this sport. Preserve parks and open spaces ! Are there any rock climbing locations around upstate New York? Aotearoa New Zealand and Australia have adventure playgrounds with features that would be considered too risky for insurance and lawsuit conscious public parks in many US communities. I remember when we could not get a skate park approved in a city park in Oregon because of the perceived "undue risk." I am glad to see that these rock climbing features are being made available to youth in city parks in serveral US regions now. I hope this trend continues. Thank you for your efforts in making kid dreams come true! Hello, I am writing from Buffalo, NY. My wife Christian and I are avid climbers (we met ice climbing) and are seeking to incorporate regional climbing access in our area through our company Adventure Sports Development LLC. Would love to talk about steps we can take to work with the Trust for Public Land. You can see more of what we do at our website: www.adventuresportsdevelopment.com or give me a call at (716) 983 0728. Thank you for your great work! Great idea for getting kids out of the house and getting fresh air and exercise. I would like to see one in every park. Due to the work that The Trust for Public Land has done in providing recreational areas in cities such as Philadelphia, I will make another donation. I am thrilled that they have built playgrounds in densely populated urban areas. Kids need these facilities for physical and mental health. I hope someone in Houston will consider putting such a wall, or walls, in the Buffalo Bayou park area. What a great idea for giving children the opportunity to learn to climb and to build upper body strength as well as lower body. Hi! I work for a local parks system and I’m wondering if there’s a process for applying to be a part of this program. We are here in Charlotte NC.